World War 2 spanned five years, from 1939 to 1945. This page covers (broadly) the first half of that war. 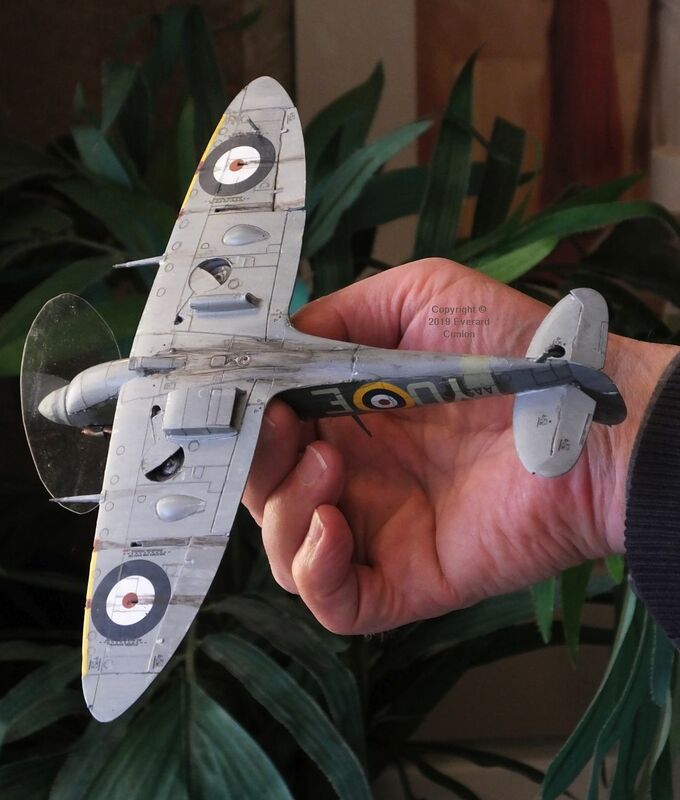 The 1/48th scale Spitfire has a nine-inch span. 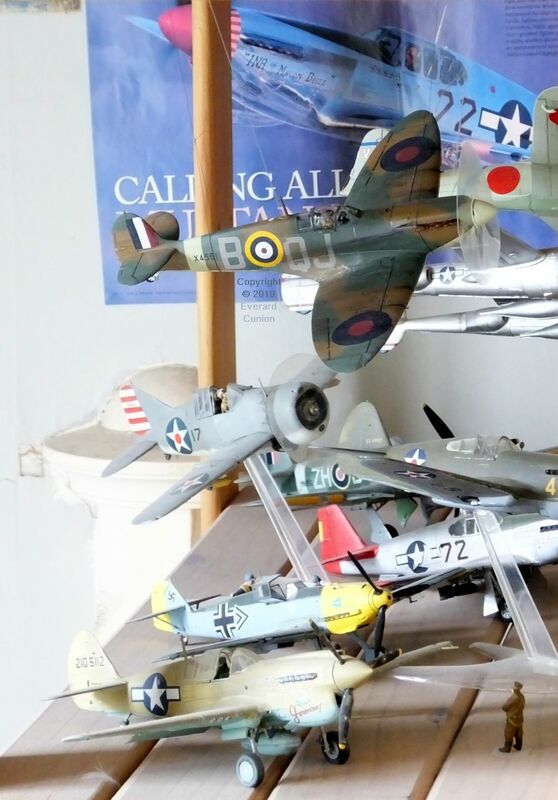 Two models… The Tamiya 48th scale Supermarine Spitfire Mk 1 is on a transparent Airfix stand. Standard RAF fighter camouflage during the summer of 1940 was this pattern of ‘RAF dark green’ and ‘dark earth’ on the upper surfaces and fuselage, and a ‘sky’ (often described as ‘duck egg green’) underside. 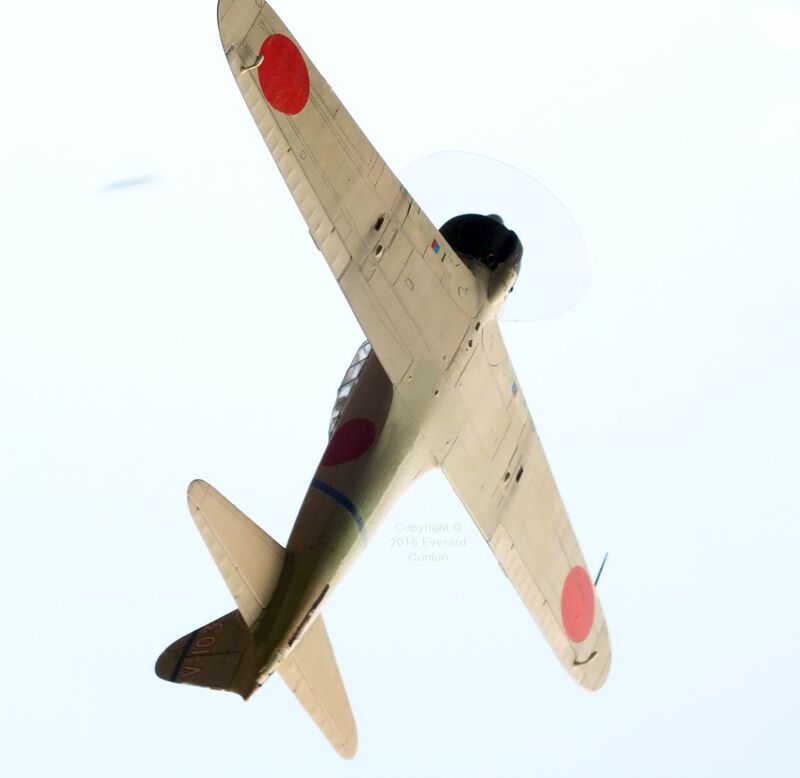 Propeller spinners were either sky or black. Often a sky band was painted round the aft fuselage, as here. 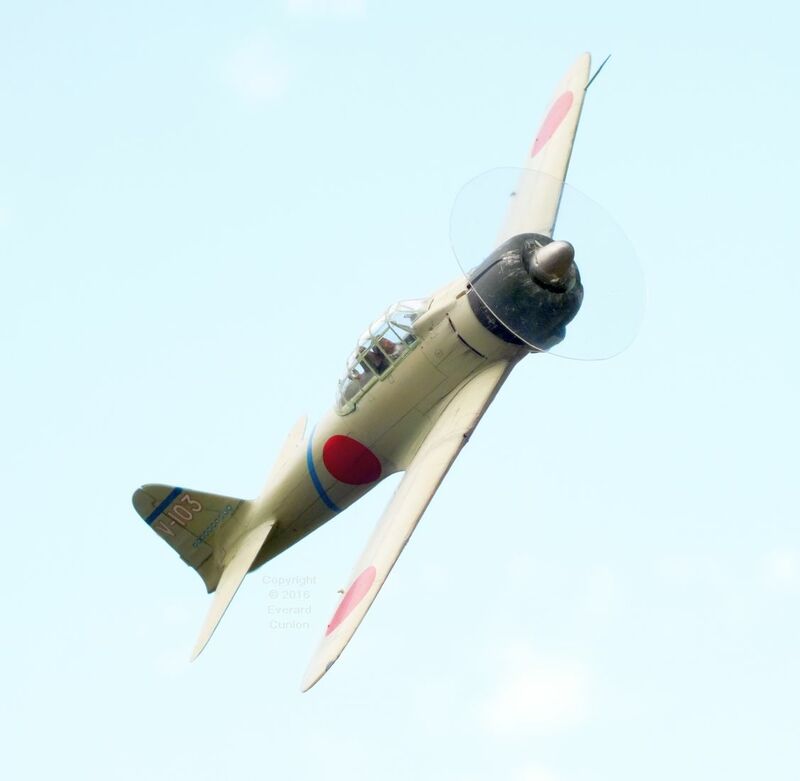 Some squadrons painted one wing underside black. Roundels were the ‘A type’ with a large amount of white (and, where applicable, yellow) and the small central red disc. The fin flash was equal red, white, and blue (in horizontal division). 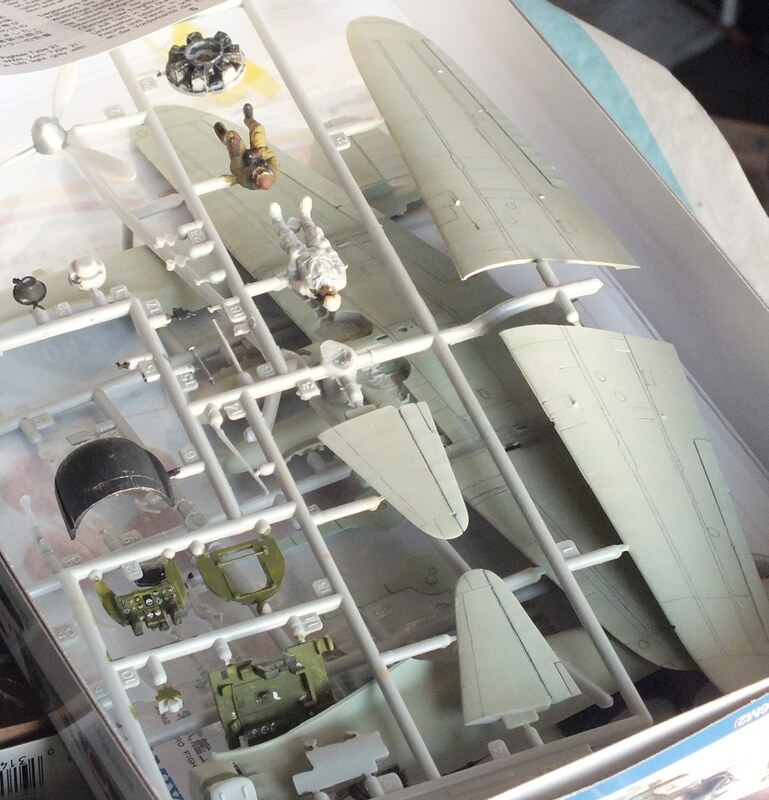 The gray squadron codes on the fuselage sides were, in my opinion, normally a lighter shade than those supplied with this Tamiya kit. 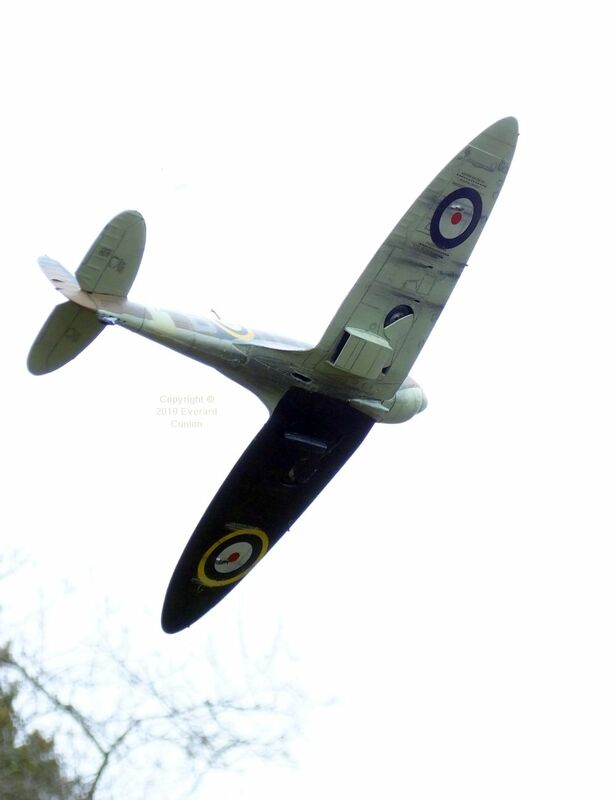 The under-belly oil stain was a hallmark of the Spitfire. I made the propeller disc by cutting it out of transparent plastic sheet. Cutting the central hole so it fits the spinner is the most difficult part. I filled the holes in the spinner (for the omitted propeller blades) with plastic putty filler. 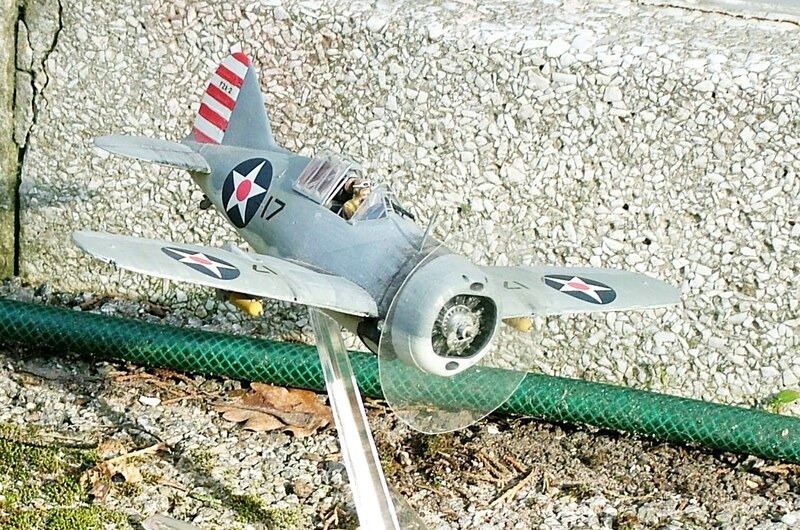 Other than the fake spinning propeller, I made this Tamiya kit exactly as supplied. However, Humbrol ‘dark earth’ has drifted from specification over the years. (It is too dark and too red, which struck me when I first painted this model in 2012, and my suspicion was confirmed on the Britmodeller forum.) Therefore, in 2019, I repainted the upper surfaces in Valejo acrylics. I then added replacement decals, which I found on eBay after about a year of waiting for a set to come up for sale. 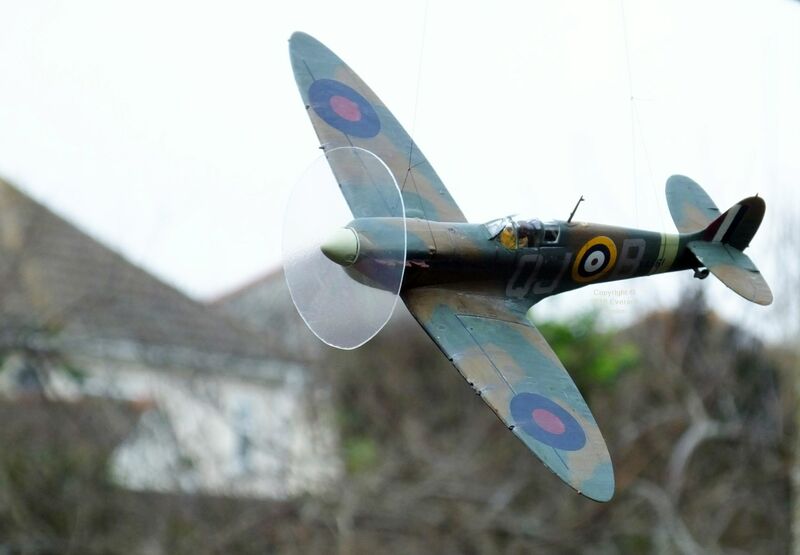 See the English Channel section of this page for my Airfix 1/48th scale Spitfire Vb of a year later than the Battle of Britain, by which time RAF day fighters had changed to a different colour scheme. 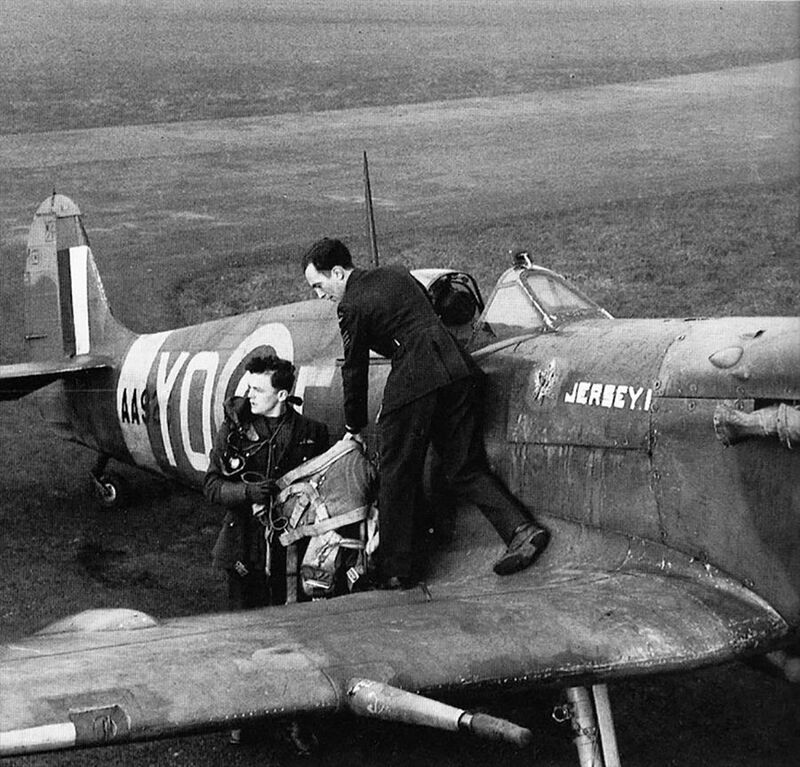 After the French and British forces withdrew from France to England in the spring of 1940, the RAF fought the Luftwaffe over southern England. That air battle, fought during the summer and a warm and largely cloudless early autumn, prevented the armed forces of Germany from invading Britain. 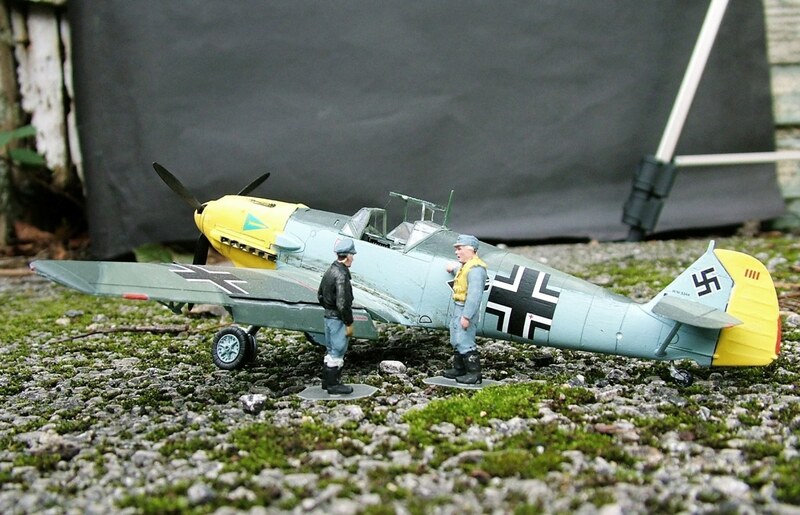 Even in 1/48th scale, the Bf109 is a small model. This is the Tamiya kit. 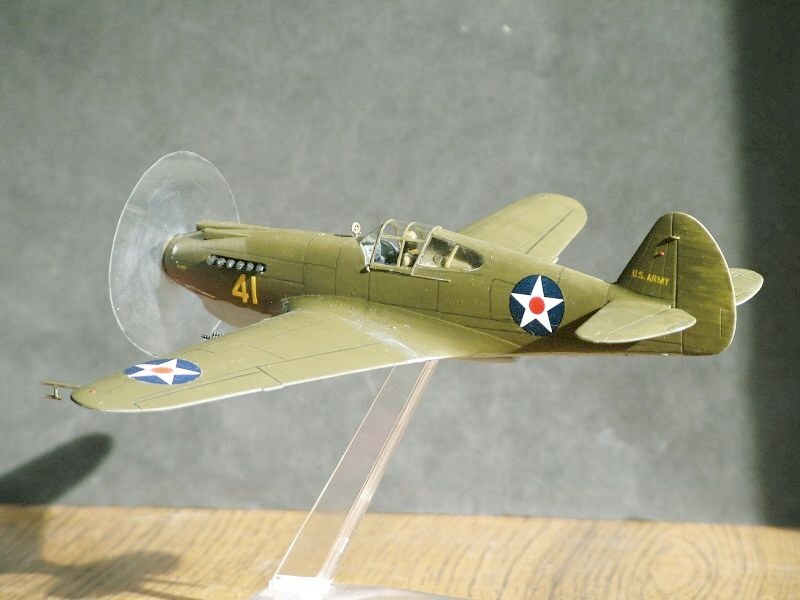 This is an early P-40, before the red disc was deleted from the US star after the attack on Pearl Harbor. 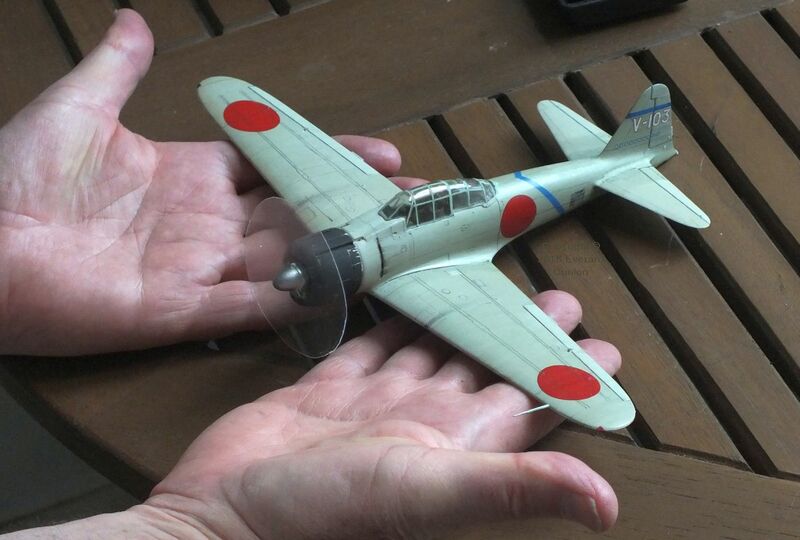 My Tamiya 1/48th scale Mitsubishi A6M2 Zero was on my modeling table for three years! Nevertheless, I think that the result is good, by my own rough-and-ready standards. 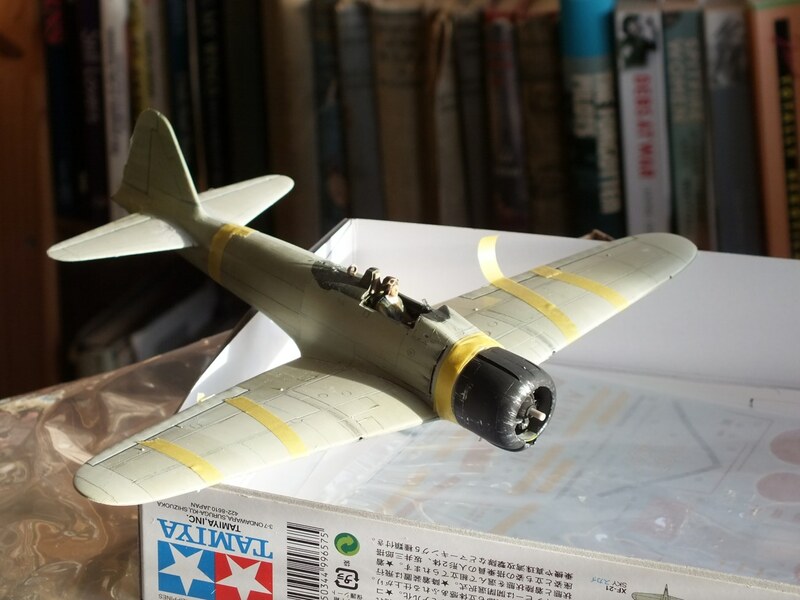 I finished this example, as flown by ace Saburō Sakai, in a moderately ‘weathered’ state, so it is a while after Pearl Harbour. 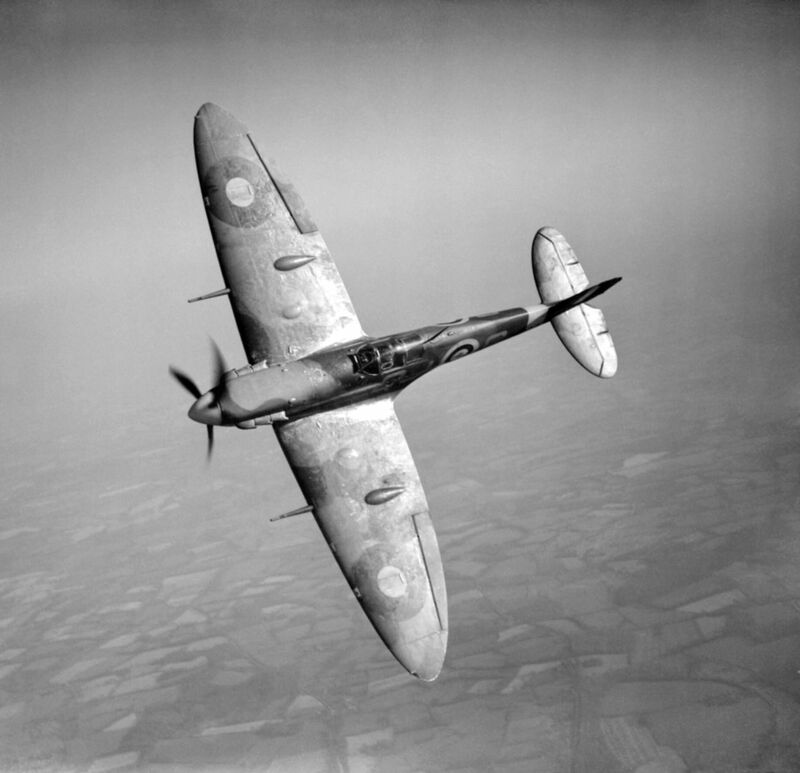 In the summer of 1941 (the year following the Battle of Britain) recognising that RAF fighters spent more time over the English Channel than over land, standard RAF day fighter camouflage was changed accordingly: ‘Ocean grey’ replaced ‘dark earth’ on the upper surfaces while ‘medium sea grey’ replaced ‘sky’ (duck-egg green) on the undersides. 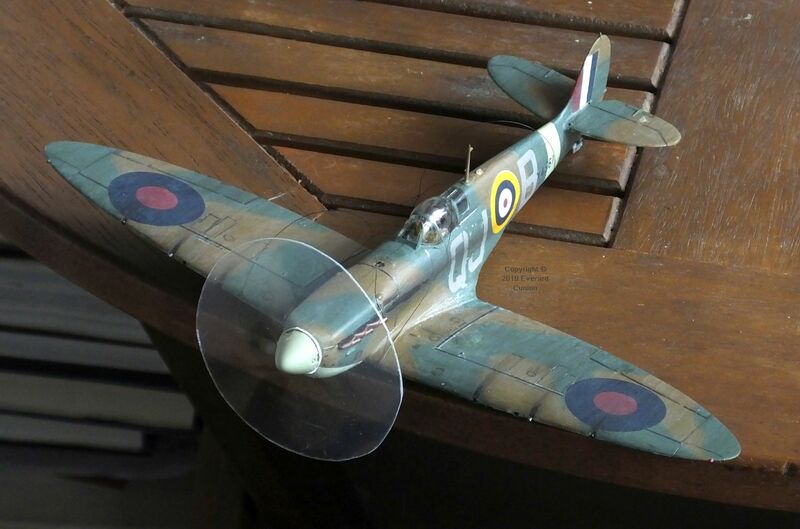 I finished this Airfix 1/48th Scale Spitfire Vb in those colours. It was, arguably, an interim scheme before they additionally changed to the C-type roundels and fin flash with thinner white and yellow bands the following year (1942). This kit is engineered so that the essential and characteristic dihedral angle emerges from its construction. Two versions are provided for in the kit. One, based on the Mediterranean island of Malta, has the tropical air intake filter under the nose and the other does not. 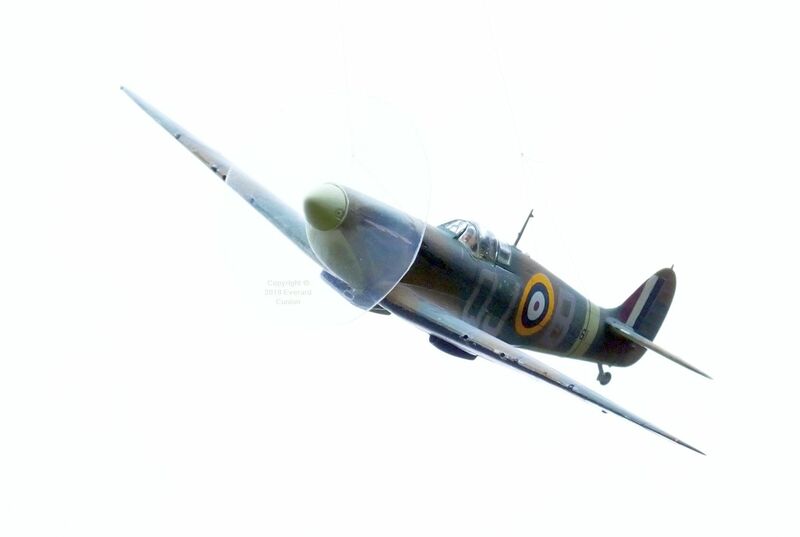 However, the latter is not strictly a World War 2 Spitfire. It is a restoration, still flying in 2019, and it has a later front canopy/windscreen as well as other differences. I built mine as a non-tropical example, but I used the canopy and other parts of the tropical variant because those are the correct ones for the period as far as I could determine from contemporary photos. I also bought a set of decals (transfers) by Xtradecal (Hannants) that includes markings for a UK-based Spitfire Vb based at Biggin Hill in October 1941. Different parts for wheels-down and wheels-up are provided. (For wheels down, precise angles are specified.) Two different canopy types are included, and two of each of those: Open and closed. 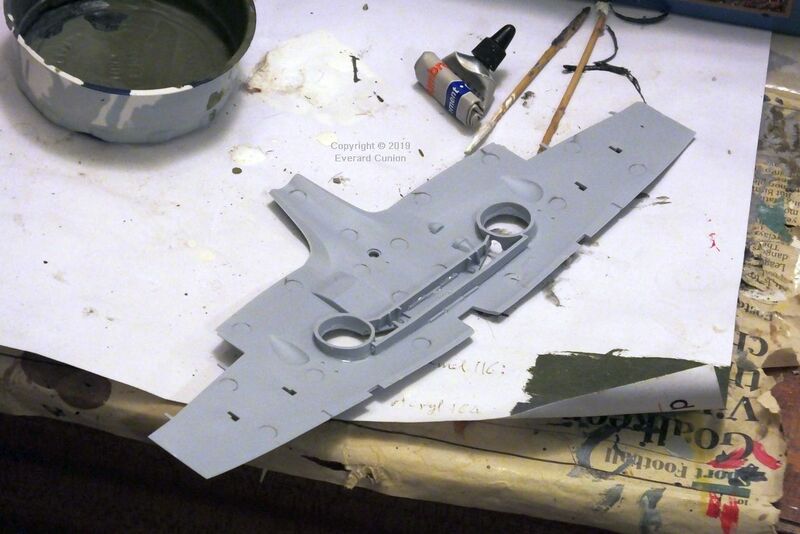 Some cutting/shaving of the fuselage sides is required for the closed canopy, so this is not a beginner kit. There is a great amount of cockpit detail. I omitted much of it because I built it in ‘flying’ configuration, so you would not see it anyway either because it is out of view when the canopy is closed and/or it is obscured by the pilot. I needed to cut, file, and melt down (with a soldering iron) the base of the cockpit tub to get the wings to fit. In the process, I did a small amount of damage to the rear edge of the recess where the wings attach, which I repaired only partially with filler. 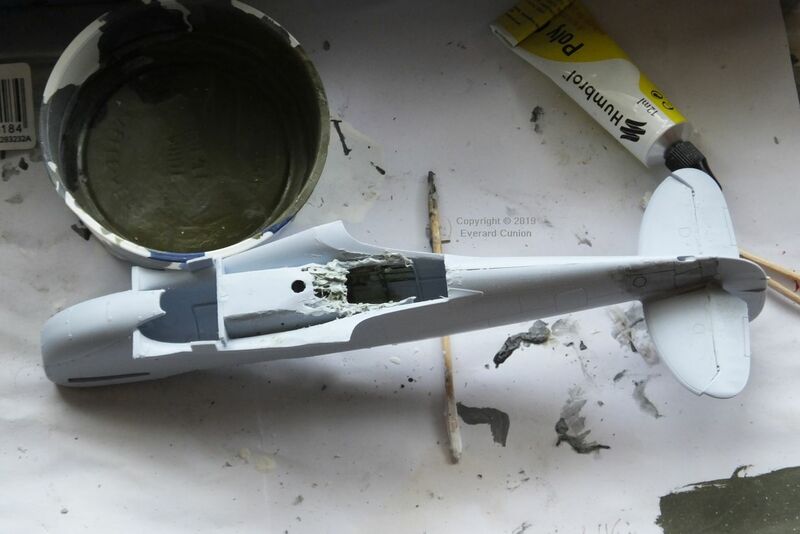 I noticed no others on the Britmodeller.com forum reporting a similar problem, so I suspect that it resulted from a mistake I made positioning the cockpit tub inside the fuselage. Another problem I encountered is with the cutting down of the fuselage sides to accommodate the closed canopy. That cutting is done before you glue the two halves of the fuselage together with the cockpit and pilot in place. When I test-fitted the canopy, I found that I had not cut the cockpit sides down enough. (We are talking fractions of a millimetre.) I found it too tricky to use a knife or file to cut it down further, so I used a soldering iron to melt it down. After I cleaned it up, it was not too bad. I was unable to attach the mirror on the top of the canopy. It is just too tiny and the fifth time I dropped it from my tweezers, I stopped looking for it. No sense in risking mucking up the canopy just for that. As always with propeller-driven aircraft in flight, I made a ‘spinning’ propeller as best I could by using a disc of transparent plastic. All paints I used are acrylics except the copper tint on the exhaust pipes (enamel). 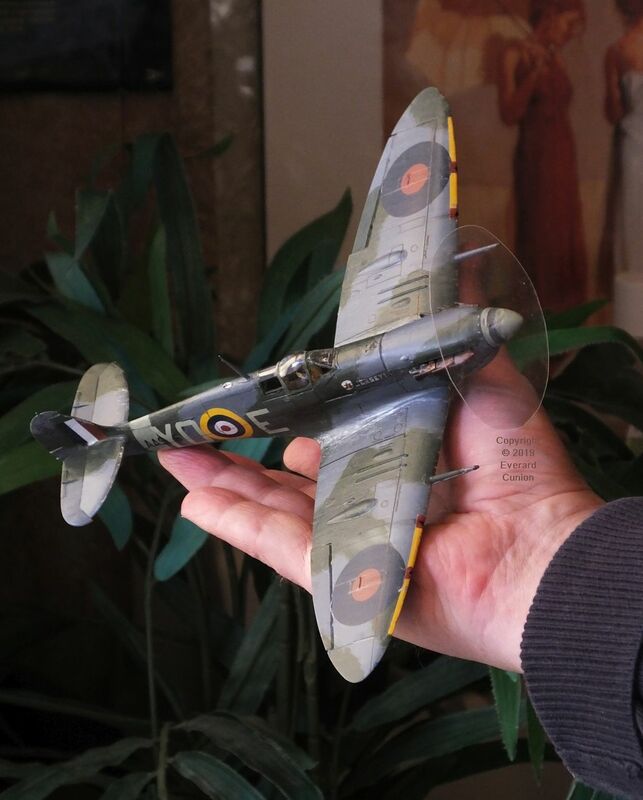 I used satin varnish to obtain a semi-gloss appearance as if the paintwork is damp from having just emerged from cloud, which the grey-green scheme suits — the ‘Indian summer’ of the Battle of Britain being a year in the past by the time of this aircraft. 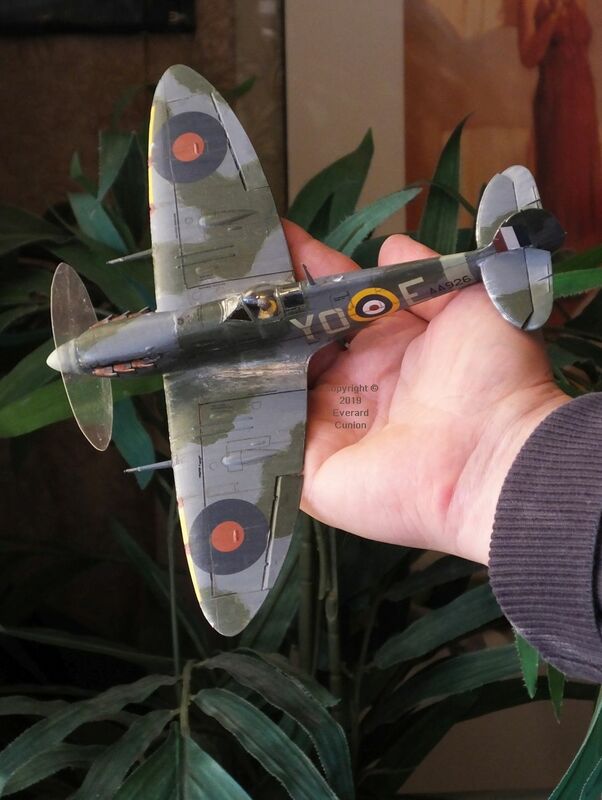 See also the Battle of Britain and before section of this page (at the top) for my Tamiya 1/48th scale Spitfire Mk.1 in the brown, green, and ‘sky’ colour scheme of the previous year; 1940. I do many difficult things, from flying hang gliders to computer programming and serious mountain biking, but plastic modelling is I think most difficult of all. Update: After moving much furniture and using a portable lamp, I found the spinner in hidden a place where it was not visible prior to moving the furniture. Moreover, I do not understand how it got there just by dropping and bouncing. It is almost as if these parts behave like sub-atomic particles, ‘tunneling’ wave-like through other objects, to re-emerge solid in the new location. The real thing here is without the strakes on the upper wing surfaces and also without yellow strips on the outer leading edges, which led me to believe that it might be one of the small number of Mk.1s fitted with 20 millimetre cannon experimentally in 1940. 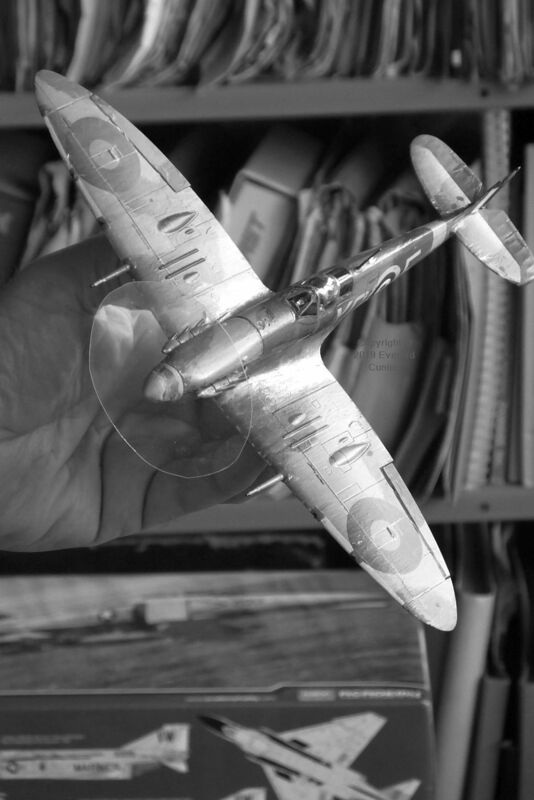 However, according to one expert on the Britmodeller forum, it is Spitfire Vb RK6923 of 92 Squadron on 19 May 1941. The yellow outer leading edges were added after August 15th, 1941. Hero to Zero, my review of the anime The Wind Rises, which depicts a version of the life of Jiro Horikoshi, designer of the Mitsubishi Zero. The anime also constitutes a history of Japan in the first half of the 20th Century. The Zero designer had one of those perfect design eyes. Aesthetically it is one of those rare designs where every line is flawless. 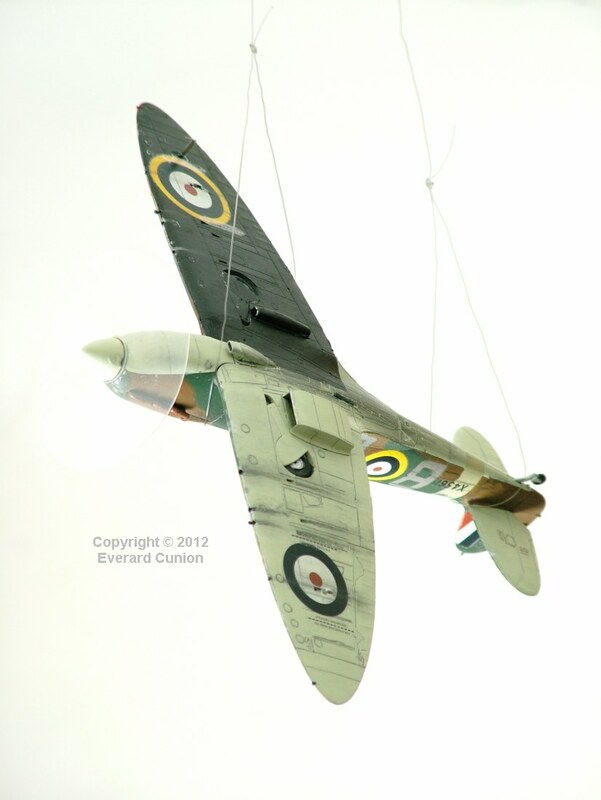 The Hawker designer, Sydney Camm had a similar skill. In this age of CAD it is increasingly rare which is why I always design with a very soft pencil prior to going anywhere near a CAD screen.